Why isn't a subscriber receiving my email? Let's say one of your patrons reports that they are no longer receiving your weekly reminder emails. This support article will walk you through how to answer the question, why isn't this subscriber receiving emails? The first place to start with these types of questions is by looking at the WordFly subscriber profile. The profile landing page will tell you right away whether the subscriber is receiving emails or has a flagged event suppressing emails. You will also be able to check subscriber activity and list inclusions from the subscriber profile. On the subscriber profile landing page you will see right away if a subscriber is receiving emails by the icon sitting to the left of the subscriber's address. Check icon This subscriber is receiving emails. Alert icon This subscriber probably is not receiving emails because they are being filtered out when imported. The subscriber remains filtered out unless you specifically say to override the issue on a list-by-list basis or at the subscriber level. Slash icon This subscriber is not receiving emails. The subscriber is suppressed from the list when any campaign is sent. Opt-outs should only cleared if the subscriber has expressly consented to the override. Abuse Complaints can only be cleared through a process that involves subscriber consent and WordFly support. Learn more. Learn more about this status in our post, Subscriber Sending Status. Click on the activity page icon from the subscriber's profile. You can use the Event filter to review event activity. Events that prevent sending to the subscriber's address include: opt-outs, hard bounces, and abuse complaints. If any of these appear then this explains why the subscriber is not receiving emails. Refer back to the previous section to adjust the subscriber's sending status if the subscriber would like to receive emails again. Visit the subscriber's list page if you've checked the subscriber profile and the sending status is alright. Click on the lists page icon from the subscriber's profile. This page will tell you if the subscriber is simply not in the lists being used by your email campaigns. On the lists page of the subscriber profile you can use the Status filter to review the lists the subscriber is in or not in. From the Status filter select Subscribed to find all lists the subscriber is in. 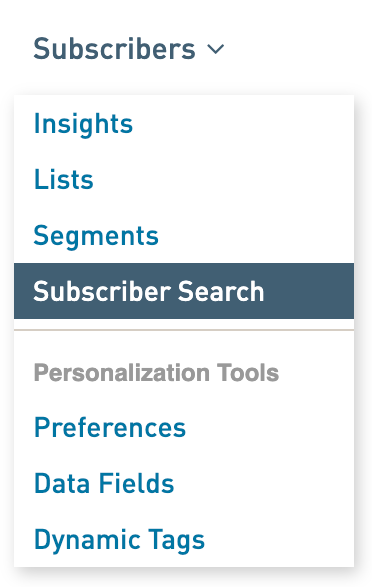 Or select Not Subscribed to find all lists the subscriber is not in. *Tip: Use the Date filter as well to fine tune the results. Is the subscriber on a recent list import and doesn't have a response? It could just be that the subscriber wasn't on a new list. Check your lists to make sure this subscriber is opted in to the ones they expect to be. Did the subscriber have a flagged event such as an opt-out response? Then any list imports after the opt-out was recorded will not have the subscriber on the list.